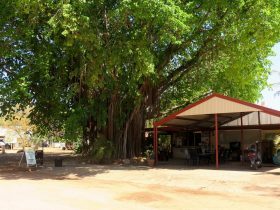 The Mataranka township, 100 kilometres south of Katherine on the Stuart Highway, was the setting of the famous Australian novel, We of the Never Never, by Jeannie Gunn. Jeannie Gunn, ‘The Little Missus’, lived at nearby Elsey Station and her affection for the area has been immortalised in her book. Within Elsey National Park, you will find the grave of her husband and a memorial to the author at the Elsey Cemetery and Reserve. Elsey Station is now administered by the local Aboriginal people. The ancient dreamtime stories of the Mangarayi and Yungman tribes describe a wind sweeping in from the east that created the area. 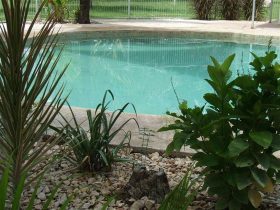 The famous Mataranka Thermal Pool is a great place to unwind. The warm, crystalline waters of the natural pools have the power to soothe aches and pains after a long day on the road. The water is spring fed, bubbling up at a fairly constant temperature of 34 degrees Celsius. The surrounding paperbark and palm forest filters the sun and leaves soft, dappled light playing on the water’s surface. The area around the pools is a natural breeding ground for the little red flying fox, whose breeding season is usually from November to May, but often extends into the drier months. During the breeding season, there are ranger guided talks available. 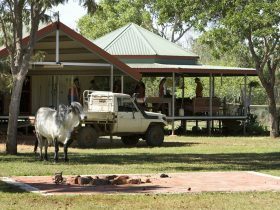 Bitter Springs, a short drive north-east of Mataranka, is a relaxing alternative to the main thermal pools. Take your goggles, because small turtles and fish can often be spotted below the surface. 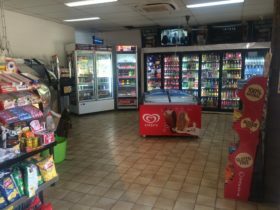 Mataranka is an Urban Location area within the local government area of Roper Gulf in Northern Territory, it is located approximately 364kms from the capital Darwin and extends over an area of 231.704 square kilometres. Mataranka has a recorded population of 350 residents and is within the Australian Central Standard Time zone Australia/Darwin. If you are planning a visit to Mataranka we’ve put together some of the things you can see or do while you are here. These include, places to stay, tours and attractions, some upcoming events and places where you can grab a meal. Go ahead, try one of the buttons above. Every destination has something worth seeing so start exploring… If you know Mataranka and think we’ve missed something, let us know and we’ll share it here.